Oil on canvas, 16 x 26 in. Who can be termed a “California” artist? Some California scenes were painted by artists who visited the state only briefly, as tourists. 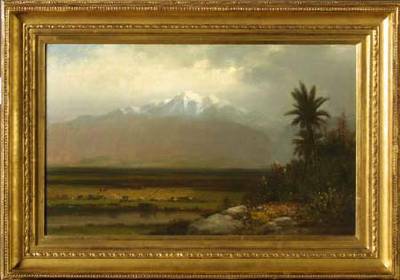 Lemuel Wiles, an East Coast landscape painter and art teacher, was in California in 1873 and 1874, having arrived via the Panama Route. He settled for a time in San Diego from which he made sketching excursions throughout Southern California. One was to Los Angeles’s “Inland Empire”, the broad, fertile valley that extends for many miles east of downtown toward the desert. There he encountered Cucamonga Peak (8859 ft.) in the San Gabriel range. His composition in his painting of Mount Cucamonga, like that of many Hudson River School landscapists, was a panorama seen from an eminence, looking across a valley to distant peaks, in this case Mount Baldy, Cucamonga Peak and others in what is now the 12,000 acre Cucamonga Wilderness. His original oil sketches (collection of the Los Angeles County Museum of Natural History) were used over his lifetime as a basis for full-sized paintings, including this painting made in 1898. It varies from the sketch in that it shows adobe ruins in the foreground and may be somewhat fanciful in the insertion of a palm tree (although certain palms were native to California deserts). The coloration is “brown sauce” popular in the nineteenth century rather than the sunnier pastels that came into vogue with the advent of Impressionism.